You told us you wanted to wear A THIN LINE. So we got together with some of our fashion friends, and we're proud to offer a line of exclusive A THIN LINE x Jac Vanek x Pete Wentz special edition gear! 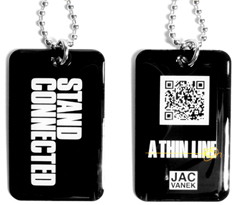 We worked closely with guest designers Pete Wentz and Jac Vanek on items that symbolize your commitment to stand connected against digital abuse. We hope this STAND CONNECTED gear will help you STAND up when you see someone crossing the line, and get CONNECTED to support if you ever feel like you need it. Get your gear now at JacVanek.com.